Personalized Patriotic Gifts and Patriotic Gift Ideas hand painted in a wide variety of Patriotic Designs to celebrate our national holidays. 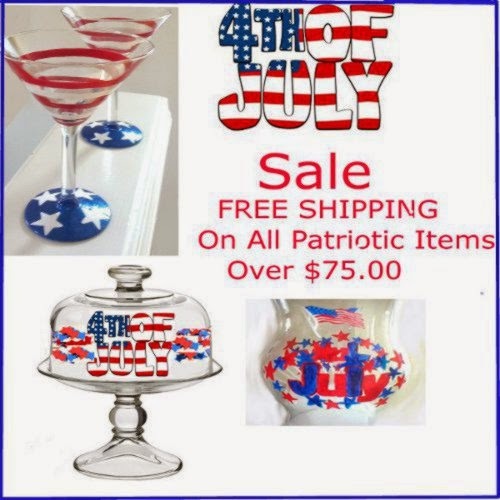 Next 4th of July, Labor Day, Veterans Day, Memorial Day celebrate with these patriotic gifts such as martini glassware, margarita glasses,wine glasses, beer glasses, 4th of July cheese domes, or a Hurricane globe for your centerpiece. Maybe you know someone in the military. Clearly Susan can come up with great Patriotic gift ideas such as red white and blue stripped wine glasses, a mug or a Christmas ornament hand painted in a Patriotic design. Choose your Personalized Patriotic Gifts with the design of your choice or request a design of your own. We can hand paint any military insigna on glasses, branch of the military that you request. Upload a picture of a design that you would like for us to duplicate.